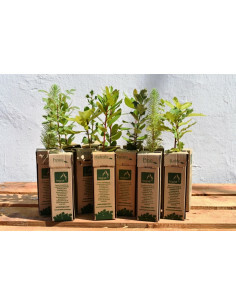 Little cork oak trees, with one sap, in little boxes ready to be given as a gift or planted. Root ball completely rooted. Cork oak or "Quercus suber". It’s a tree that is similar to an holm oak but its bark can be turned into cork after 10 or 15 years. It’s a tree that needs a little more humidity than a holm oak as well as a smoother climate although it will adapt perfectly anywhere in the Iberian Peninsula.